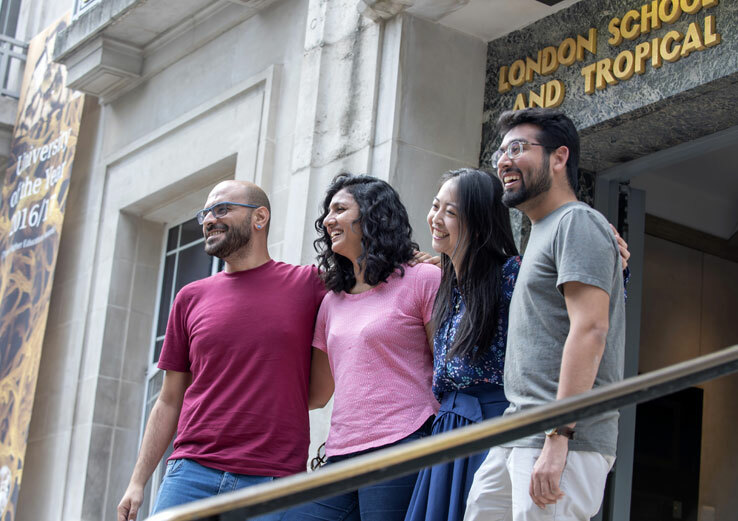 Students, academics, and professionals come to the London School of Hygiene & Tropical Medicine (LSHTM) from all over the world because of its international presence, collaborative ethos, research excellence and prestigious study programmes in public and global health. With a rich history of 120 years of world-leading research and teaching, LSHTM has built a strong and diverse international network of academics, alumni, students and partners. They all contribute to our mission of improving health worldwide, and have helped to establishing our place as one of the top public health institutions in the world. LSHTM consistently ranks highly in various global university league tables, and has a strong academic and media presence worldwide. #1 in Europe for research impact in sciences, based on proportion of publications that belong to top 1% most frequently cited publications - 2018 CWT Leiden Ranking. LSHTM is uniquely placed to bridge the gap between academia and global issues, shaping health policy and translating research findings into real-life impact. Below are just a few examples of how we achieve this. The UK recently launched a ‘sugar tax’ on sweetened drinks. It was introduced in April 2018 as part of the Government’s childhood obesity strategy and it aims to reduce sugar consumption by persuading companies to reformulate their high sugar brands and avoid paying the levy. In the first study of its kind, published in April 2018, LSHTM Professor Richard Smith, working with Dr Cornelsen and others, found that extending fiscal policies to include sweet snacks could lead to larger public health benefits, both directly by reducing purchasing and therefore consumption of these foods, and indirectly by reducing demand for other snack foods and sweet drinks. One of the projects of LSHTM’s Centre for Global Chronic Conditions is STRENGTHS. Funded by the EC’s Horizon 2020, the project’s aim is to strengthen mental health care for Syrian refugees arriving in Europe by training people in the refugee community to deliver the mental health interventions, making mental health care more accessible and more cost-effective. Successful delivery of this programme will reduce suffering for people who have experienced hardship, and have a long-term impact on the mental health of newly arrived refugees and their families, improving their ability to quickly become productive members of their new society. During the 2014/15 Ebola outbreak LSHTM staff assisted in response planning, conducted clinical trials of vaccines and treatments which showed promising results, and volunteered on the frontline in treatment centres. In 2016, LSHTM was chosen to jointly run the Government funded UK Public Health Rapid Support Team in partnership with Public Health England, to respond to disease outbreaks before they develop into health emergencies. Peek, developed at LSHTM, is an adapted smartphone that can carry out eye tests and diagnose vision problems. It has been tested as a potential tool to revolutionise blindness prevention in low-income countries. The Monkeybar project studies Plasmodium knowlesi, a malaria parasite previously thought to only affect macaque monkeys but now increasingly found to affect humans. LSHTM is pioneering the use of drones to understand how environmental factors influence the spread of infectious diseases like this one. Postpartum haemorrhage is the leading single cause of maternal mortality worldwide. The 2017 WOMAN trial coordinated by LSHTM discovered that the use of a simple drug could reduce death due to bleeding from postpartum haemorrhage by a third. LSHTM led the first study systematically to examine the extent to which projected environmental changes could affect the global production of common crops. The research highlighted that some of the most important foods and some of the world’s most vulnerable people are most at risk. The study was a wake-up call, and underlined the urgency of tackling climate change and improving agricultural practices. You can read more about our work on topics including malaria, vaccines, sexual health, the NHS, climate change, maternal health, antimicrobial resistance, outbreak response and more by visiting our features page.